Last time, after I introduced Kynžvart castle to you, I promised to take you into the castle’s park so let’s get off. When Klemens von Metternich had the castle remodelled in the Classicism style, he decided to accompany the new castle’s look by an adequately looking park. He invited a Viennese landscape architect Riedl and let him elaborate new park conception. As a matter of interest, it is said that Metternich was presented by the Russian tsar Alexander I. with giant hogweed’s seeds (Heracleum mantegazzianum). He let the park decorate with the plant and caused unintentionally many future problems. As in some other countries, in the Czech Republic the giant hogweed is regarded as a toxic and dangerous invasive plant damaging original ecosystems. When we approached the castle, we noticed a direction sign heading for a wood chapel. We followed it and came to a wonderful place hidden in the park. 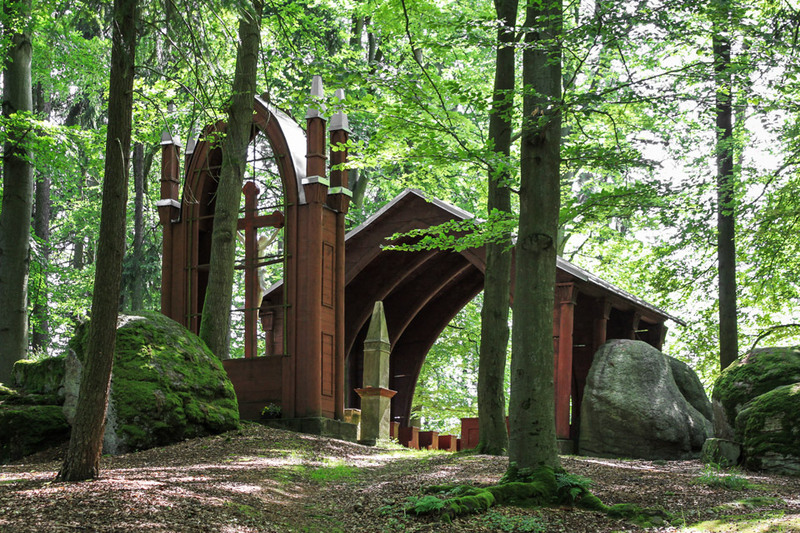 The chapel which is situated there consists of roofed wooden church benches and an altar in front of them, an altar through which you can see the trees and sky behind. As for the history of the chapel, it comes from 1692 when a chapel was built in a place worshipped by pagans. The chapel was guarded by Benedictines, reputedly to prevent cult sacrifices. In this place or perhaps nearby, a unique wooden pseudo-Gothic chapel was built in 1835. On the left and right sides of the altar, there are stone columns with inscribed 1692. Participating in a Mass must be a great experience there. Since 2008, substantial part of the park has been remodelled into a golf course and from what I could see, the course suits the place very well. Linda, thanks. We always don’t know where to go for a trip and then we discover some interesting place like this. 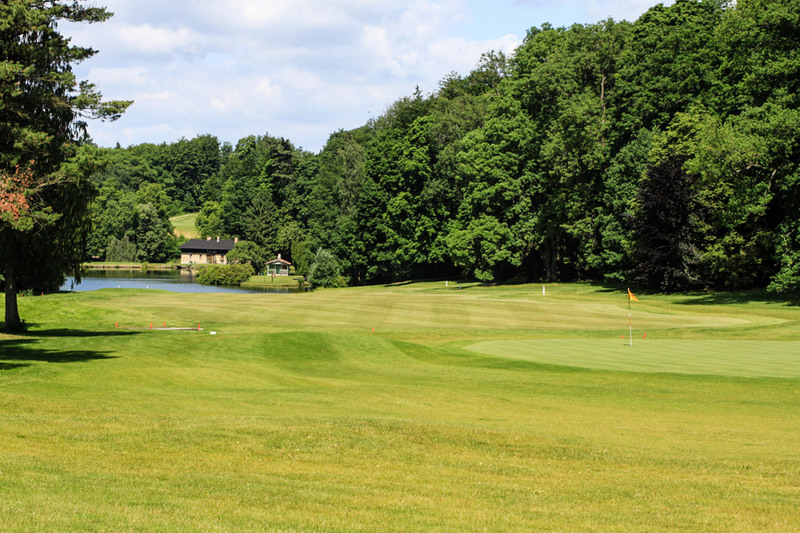 As for the golf course, I really didn’t mind it there and even found it interesting and matching the place. You don’t know the connection but when we came to the castle, quite near by the front gates there was a gathering of people doing Tai-Chi exercise and so the golf was just one more sports activity. What a beautiful looking chapel Petra. Keith, thanks. The view through the altar was really very impressive. Interesting that they spent that much on personal dwellings and grounds. Great that over the years these places wee preserved and protected . I’m not sure about the golf course in this area. Red, it’s interesting that Metternich took out a personal loan for that reconstruction of the castle, a loan of 900 thousand gold coins (equivalent to 45 million € nowadays), due in 12 years at 5 per cent interest. But it was a representative seat for his position, probably worthy of that investment. As for the golf course, it may look weird as it’s lifted out of context here but I really didn’t mind it in the place. 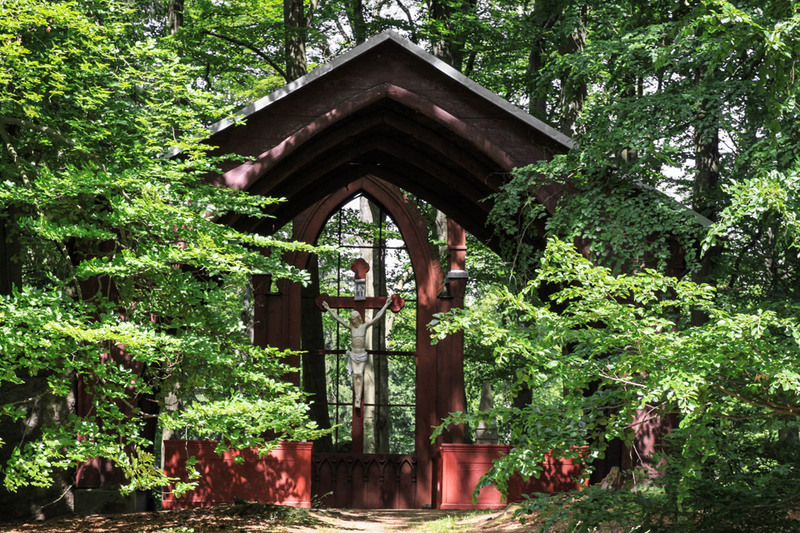 I love that outdoor chapel! It was fun to see the post on the castle and now the grounds. Special places should be savored like fine wine. I think I’d like the gardens better without a golf course, though. Sarah, I found the grounds worthy of a special post as they had impressed me that much. As for the golf course, I can see that the overwhelming majority of comments doesn’t seem it to be appropriate in the castle’s proximity but I didn’t perceive it to be spoiling the place’s atmosphere. 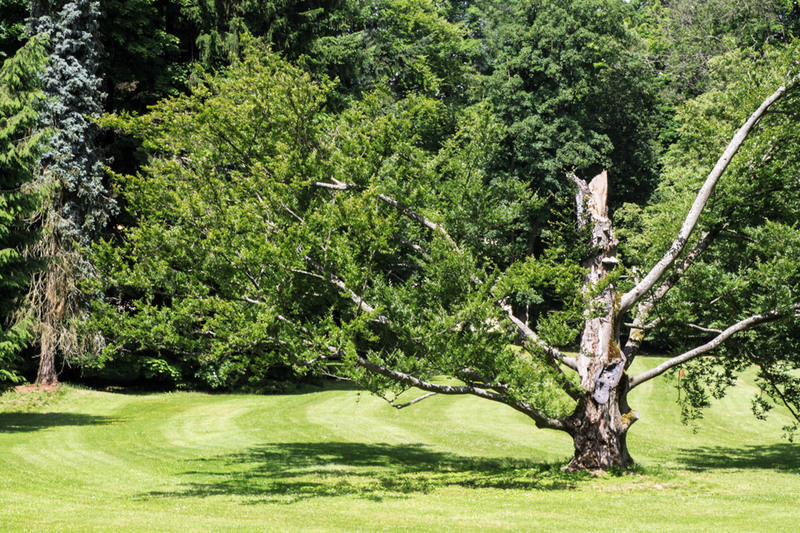 Golf is played in nature and the park represents nature so if the course brings more people to visit the castle and to enjoy its grounds, why not? That is my kind of church, I love the idea of meeting in the open air. JoLynne, I absolutely agree, meeting there must feel great. The chapel is both an interesting and amazing structure that would be a wonderful experience to savour. Nice selection of images too. A beautiful place with or without hogweed, but as you say, we have a tendency to destroy the ecosystems in this way. Re the cobblestones: In steep street the ones in the middle were laid differently to prevent the horses from slipping. Rune, thanks for your comment and for the explanation of the cobblestone system. I was thinking of cars, bicycles and pedestrians but horses didn’t come to my mind at all!